This Thursday is summer solstice, which is the longest day of the year and the official beginning of summer. Some cultures celebrate this day with festivals and rituals, but at our house we just tend to stay outdoors and marvel at how it's still daylight at almost 10 pm. There's a certain magic to this time of year that hides in plain sight. Maybe you've noticed that green things are awake. Plants and vines are growing wild under summer's spell, and I can't seem to keep well-camouflaged caterpillars and leafy-looking bugs off of my tomato plants. I wanted to make something sweet that celebrated the green things taking over our landscape, so I began digging through my overfilled box of cake decorating supplies. I found my inspiration in a candy mold with an ornate frame motif. I have too many candy molds that have never been used, and this is a good example of that. I've promised myself to do a proper inventory and put them all to good use! 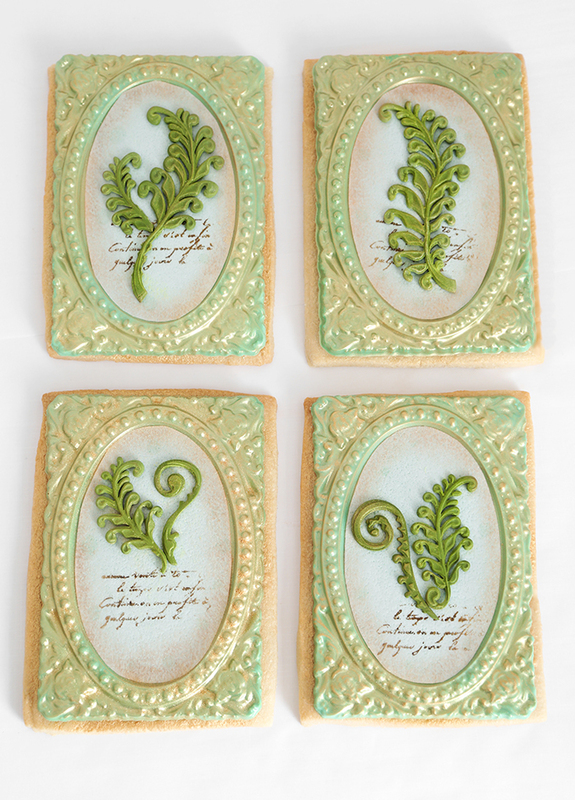 Sugar cookies seemed to be the most fitting blank canvas for these botanical treats. The frame candy mold is just shy of 5x7-inches, so that's the size the sugar cookies were cut. These are hefty cookies rolled to almost 1/2-inch thickness, so you'll only get four cookies from one batch of dough. The frames were cast with a 3:1 ratio of green candy melts to bright white candy melts. I used edible rice paper to create the paper for the prints, and used a script motif rubber stamp coated with brown gel food color to suggest a plant description of the papers. (You may remember this stamp from previous projects, here and here). I also found this Wilton fern mold while digging through my cake supplies. It seemed so fitting for this project because there is a profusion of ferns growing on Tennessee forest floors. I recommend using a mixture of fondant and gum paste for these decors, because they have delicate shapes and gum paste makes them a tad more sturdy. Allow them to dry firm before adding them to the cookies. The stamped papers are attached to the frames using tiny dots of piping gel or corn syrup. 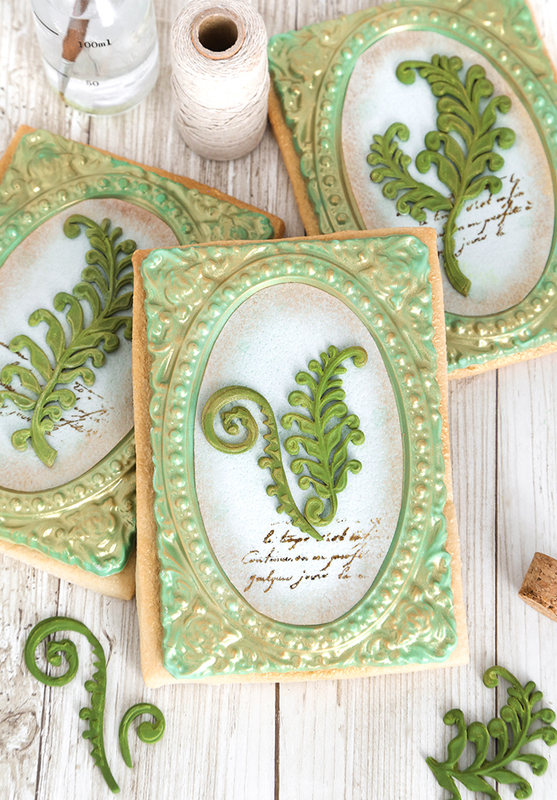 The fern decors are also attached to the stamped paper using the gel. I used brown petal dust to dust the edges of the papers to create an aged appearance, but if you don't have petal dust, ordinary cocoa powder will work, too. Use a soft, dry brush for this application. Gold luster dust is applied to the frames using a soft dry brush, also. This gives the candy beautiful shine, and gives a slight appearance of verdigris patina. Shall we hang them on the wall now? Wouldn't these be pretty at place settings? I can just imagine a beautifully set table with botanical cookies in the centers of each plate. These are not so difficult to make, but the ferns will take some time to cast and dry. 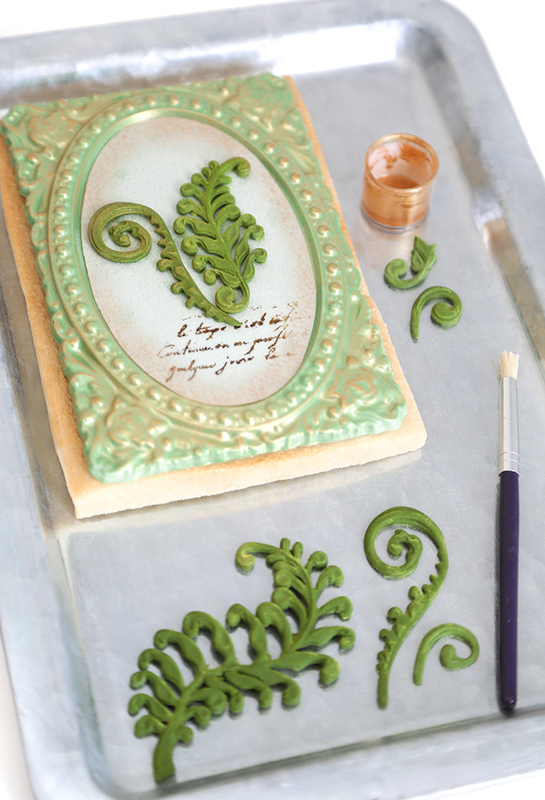 Plan ahead and create some test ferns and fiddle heads so you'll be well-practiced. In a medium bowl, whisk together the flour and salt. Add to the butter and egg mixture. Mix on low speed until a dough is formed and there are no longer any streaks of butter in the mixing bowl. The dough will often clump around the paddle attachment while being mixed. This is normal and a good sign that your dough is the right consistency. If your mixture does not come together and is crumbly, add ice cold water 1 tbsp. at a time until the dough clumps. Roll the dough to 1/2-inch thickness between sheets of parchment paper and chill until ready for use, at least 30 minutes. 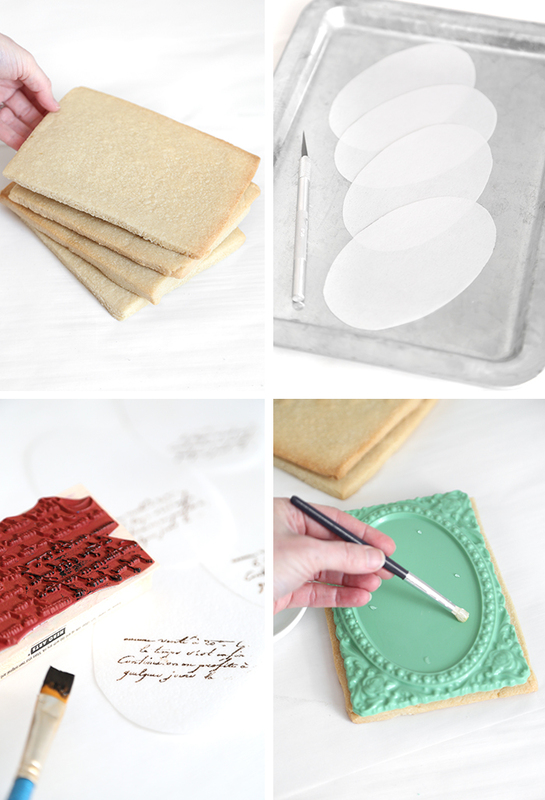 Cut the dough into four 5x7-inch rectangles (you can use a post card for a template! ), re-rolling dough scraps if needed to cut exactly four pieces. Bake for 20 minutes, or until the cookies are fragrant and golden brown on the edges. Transfer the cookies to a wire rack to cool completely. Combine the candy in a microwave-safe bowl and heat at 1 minute intervals until the candy can be stirred smooth. Transfer the candy to a piping bag and snip the end. Pipe candy into the molds and tap the molds on a work surface to remove air bubbles. 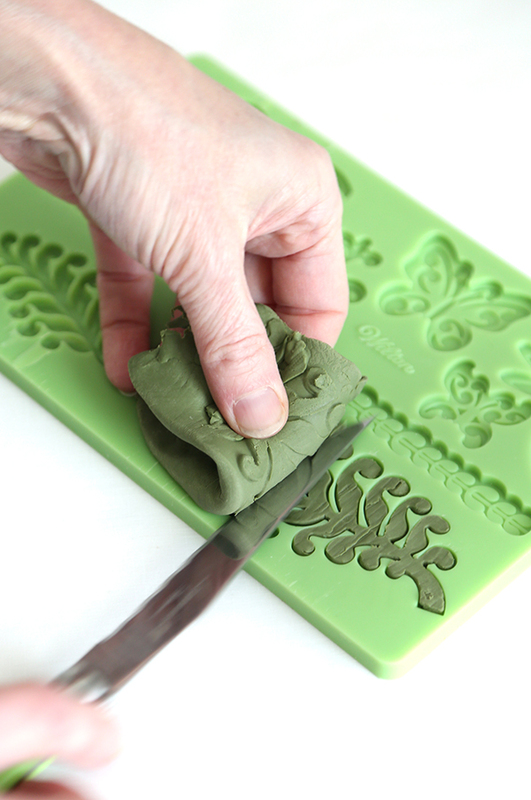 Transfer molds to a baking sheet and freeze for 10 minutes. Gently turn out the candy frames onto a piece of parchment paper. Attach the frames to the cooled cookies using dots of buttercream. Using the center of the frame mold as a guide, create an oval paper template. Use the template and food color marker to create oval shapes on the rice papers. Cut out the ovals using an x-acto knife or kitchen-dedicated scissors. 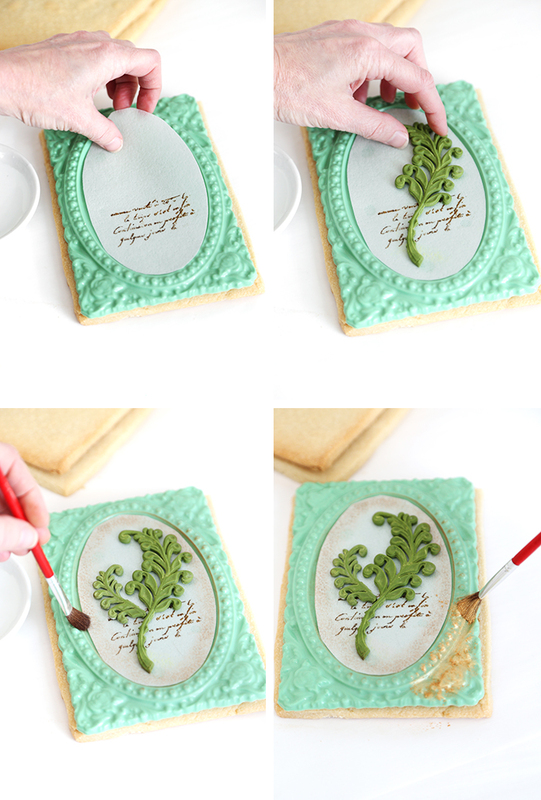 Use a soft bristle brush to coat a small area of the rubber stamp with brown food color. Stamp the lower third portion of the rice paper ovals using the stamp. (Re-ink with food color as needed). Set aside to dry, about 20 minutes. Place tiny dots of piping gel around the inner edge of the ovals on the candy frames. Place the oval rice papers inside the ovals and press lightly to adhere. 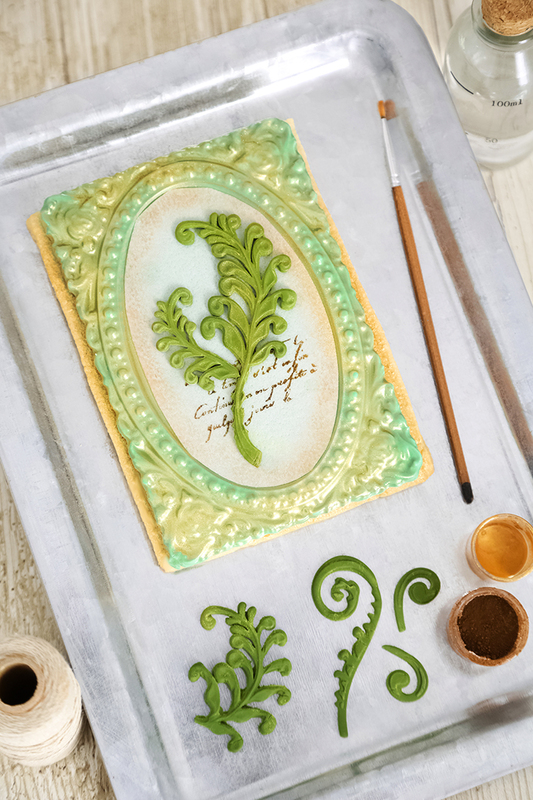 Let dry while you cast the fondant ferns and fiddle heads. Lightly dust the fern mold with powdered sugar and tap out any excess. Knead together the green fondant and gum pate. Press the mixture into the molds until overflowing with fondant, and then trim the excess away using a knife (see video for visual). Flip the mold over and bend to release the fondant pieces. Let dry until firm, about 1-2 hours depending on humidity. Attach the fondant decors to the rice paper using dots of piping gel or corn syrup. Brush brown petal dust or cocoa powder around the edge of the rice paper to create an aged appearance. Use a dry brush and tap away the excess before applying to the paper. Dip a dry brush into the gold luster dust and apply to the green ornate frames. Apply a little at a time, so that some of the green still shows through the gold. Let the cookies stand for 1 hour to set completely before packaging or transferring to bakery boxes. Once again I am blown away by your artistry Heather! Amazing! They are so beautiful I couldn't bare to eat one!